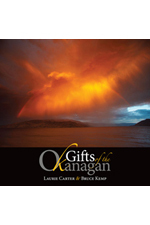 Gifts of the Okanagan, a stunning visual celebration of British Columbia’s Okanagan Valley by Carter and her husband Bruce Kemp, conveys an intimate knowledge and understanding of the region. Carter and Kemp have captured the immutable and evolving, threatened and thriving, serious and carefree facets of a unique and complex environment. Their images reveal a deep connection with their home and a profound pleasure in sharing the beauty and wonders that surround them every day. Gifts of the Okanagan is distributed by Heritage Group Distribution.